Marquette’s Shani Davis Goes For Vancouver Gold # 2 Saturday! Before speedskating star Shani Davis’s race on Saturday night, February 20, for a gold in the men’s 1500 meter long track, read up on this Olympic star athlete. On Wednesday night, Shani won a gold in the men’s 1000 meter, repeating his gold-medal performance in Turin four years ago. At MyNorth.com we’ve been following Shani since before the 2006 Olympics in Turin. In the summer of 2005, Shani took time out from his intense training schedule at the United States Olympic Education Center ice arena to talk to us about his long and bumpy road to those Olympics. Click here to read the incredible backstory on this amazing, one-of-a-kind athlete. 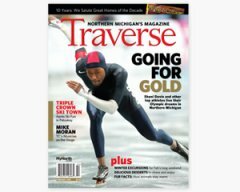 You’ll also want to read about other 2010 Vancouver Olympic stars and their connections to Northern Michigan. And since one of those stars is Apolo Ohno, stay tuned to watch Apolo race in the 1000 meter short track finals at 6:20 pm. on Saturday. A plenitude of TV’s, non-smoking policy in force, decent beer list and tasty food. A regular we know says she always loves the crab cakes and her husband loves the chicken nachos. A gigantic window overlooking the marina and a pool table help pass the time when the Olympian Yanks take a break. 820 Front, Bay Harbor, 231-439-2770. Gigantic TV: check. Smoke free: check. Friendly: check. Red Wings jerseys not mandatory during Wings games, but appreciated (likewise during Olympics). Welcome to Petoskey’s longtime sports bar stalwart. Our source says, “the Cajun chicken wrap thing is very fine.” 1200 N. U.S. 31, 231-347-9291. Like Cheers, but with a great view of East Grand Traverse Bay, this laid-back, welcoming place along the highway is a hangout for neighbors up the hill and anybody pulling in off U.S. 31. Decent number of TV’s, friendly staff. Our source: “Fabulous menu with great renditions of classic American food.” 5074 U.S. 31 N., 231-938-1610. Only two televisions, but the Mayfair is so intimate, that’s all you need. Outstanding beer selection that always has some good Michigan brew selections, including reliable selections of IPA’s on tap. Cozy, with awesome burgers and fries. Our source: “I love the Cuban sandwich.” 515 Frankfort Avenue, 231-352-9136. You can see the Yooper Dome from this sports fan gathering spot on Marquette’s 3rd Street. About a dozen televisions keep the view of the games good too. Students know the place for the $4 Shoop–a 32-oz. glass of beer. The menu is gigantic and describes pretty much any kind of bar food an Olympics devotee might want. 900 North 3rd Street, 906-226-1112.